While it's still early, it's not so early that we don't know the problem areas for each Big Ten team. The question is, can those problems be solved? Let's investigate! ** I admit, this is an odd diagnosis for a patient that gave up 93 points in 74 possessions to North Florida, but I figured Illinois fans wanted to hear something other than "you're doomed." The defense is not good, and that's even while brushing off opponents' three-point accuracy (38.7%) as bad luck. The team is also allowing teams to make 52.2% of their 2s, and with the only player resembling a basket protector in Mike Thorne out indefinitely, there's very little hope of this defense playing adequately. Oh, and Illinois will be relying on freshmen for a good chunk of minutes, and that's rarely a prescription for keeping opponents from scoring. But Illinois, in theory, can do something about the shots its offense is taking. 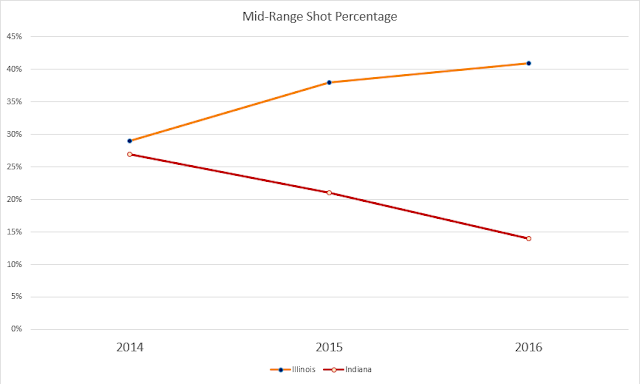 One theory is that the state of Indiana has been dumping its mid-range shots across the border. Over the past 3 seasons, Tom Crean has avoided mid-range jumpers like the poison they are, while John Groce can't seem to get enough. To be fair, there are good offenses that fill up on mid-range jumpers (e.g., North Carolina), but as Illinois' offense hasn't been good in some time, this would be the first place I'd look for improvement. ** Duke's eye-popping 1.52 PPP exposed the projections of a decent Indiana defense to be nothing more than wishcasting. And while the three-pointers got the headlines in that game, the real trouble with this defense is that it's been a virtual layup line for other teams. Per hoop-math, roughly 46 percent of IU opponent shots have been attempted at the rim, where they've been converted at a near-average rate of 55 percent. That first number ranks as 16th-worst in all of Division I. Indeed, Indiana is actually doing a pretty good job of chasing three-point shooters off the line, Blue Devil dominance notwithstanding. Tom Crean does not have a lot of shotblocking options at his disposal, but what he has should be good enough. And very few of IU opponent shots are coming in transition. But it's the transition in the other direction that concerns me. Indiana likes to run, and Tom Crean has made no secret of that initiative. The Hoosiers run more than any other team in the Big Ten, taking 30 percent of their shot attempts in transition. But one wonders if this team isn't taking off a little too quickly, and IU ranks toward the bottom of all teams in defensive rebounding. Perhaps sending more guards to collect rebounds offers a higher marginal return than hitting the gas. Will that come at some cost to the offense? Probably, but Indiana has a 61.3 eFG on non-transition FGAs, so it's not like this offense has to run to be effective. I also don't think that defensive rebounding alone can cure the defense of what ails it. But with an offense this good, getting just a mediocre defense can lead to some pretty nice results. ** All things considered, Iowa has had a pretty solid start to the season. Jarrod Uthoff has become one of the most efficient high-usage players in the country, Peter Jok has progressed into an excellent scorer that can be trusted with the ball, and even Adam Woodbury has embraced who he is (a big man that can dunk, get fouled, and rebound) and discarded who he isn't (someone that can make jumpers, a passer, a shotblocker). I don't know if I'm ready to declare Iowa dance-worthy, but this looks like close to a best-case scenario. But given Fran McCaffrey's relative preference for uptempo basketball, I'm a bit troubled by the fact that Iowa's rotation appears to be 6 players deep. In the overtime win over Florida State, all five starters played at least 33 minutes, with Dom Uhl the only other player to play at least 10 minutes. What's more, the three other guys who got in the game logged a total of 24 minutes between them, and attempted just four shots collectively. It's too early to tell which of the other guys is good enough to break into the rotation, but Dom Uhl functioning as a one-man supporting cast probably isn't going to get the job done. It also doesn't help that Dale Jones is now lost for the season. Iowa still has a few cupcakes on the schedule before conference play begins—hopefully we can soon see who can be another asset off the bench. ** Maryland came into the season with lofty expectations, largely because it was hard to see a lot of holes on a team as deep as this one. That changed when Dion Wiley was lost to injury for the season. Wiley's role in the offense did not figure to be large, but he likely would have been a competent ballhandler in this offense. Now the Terrapins are down to Melo Trimble and Rasheed Sulaimon in that regard. Those are both good guards, but asking them to constantly set up the other scoring options on the team might be asking too much, at least when facing top competition. UNC disrupted the Terps by pressuring the ball, which forced entry passes to come out early, which led to Maryland's big men needing several dribbles just to get to the block. The result has been too many turnovers for a team this talented. Mark Turgeon's motion offense allows for plenty of freedom to let players improvise. But one wonders if you want to give this much improvisation to this lineup. Jake Layman, Robert Carter, and Diamond Stone are very good basketball players, but their best work comes without an abundance of dribbling. Mind you, this offense is good, but a team that makes 40 percent of its 3s and 64 percent of its 2s should really be better than this. ** Last year's depleted Michigan squad probably outperformed the available talent, but this year's is a true return to Beilein ball. The 3s are going in, the paint is open for easy 2s, and the turnovers have been banished. But the defense isn't quite there. Mind you, a John Beilein defensive principles book is not going to be a bestseller, as the coach has exactly zero top-25 defenses in the tempo-free era. But they at least usually minimize freebies by taking free throws out of the equation. Not so this season, as the Wolverines rank 108th in defensive free throw rate, the worst figure on record for Beilein. The root of the problem is easy—literally every player Michigan tries at the center position. Beilein no doubt is aware of the problem, and I'm sure is ready to hand over starter's minutes just as soon as one of his candidates can play 30 minutes without getting into foul trouble. It's a great gig if one can clear that bar—you get all the rebounds and spend most of your time on offense dunking. ** This is nitpicking. Tom Izzo's team is doing just about everything right. They make 3s (39%) and 2s (56%). They are perimeter-oriented (37% 3PA) but still collected nearly 40% of their misses. Over 30 percent of their shots come in transition, but this is the 2nd-best defensive rebounding team in the country. Sure, the defense isn't forcing turnovers, but that's by design. But if you squint real hard, you could see some trouble ahead. Right now, Deyonta Davis and Matt Costello are splitting time at center. Denzel Valentine and Lourawls Nairn are manning the backcourt. And it's freshman Matt McQuaid and transfer Eron Harris backing up Bryn Forbes at the 3. This leaves the 4-spot relatively up in the air. Javon Bess has been getting minutes there, he hasn't played very much or very well against MSU's best opponents thus fair. In an ideal world, Davis and Costello could both start, and you could essentially have 3 ballhandlers surrounding the two centers in Nairn, Forbes/Harris/McQuaid (you have to think Harris will snap out of his slump sooner rather than later), and Valentine. Not a lot of holes in that rotation. ** I've been a frequent critic of pressing-style defenses in this space before, in large part because I've yet to see it work in a possession-obsessed Big Ten. The Gophers forced more turnovers in conference play than anyone else in the Big Ten, and the defense was nonetheless lousy (10th in efficiency). This year, Pitino seems to have completely abandoned the pressure defense he learned under his father and implemented at FIU and Minnesota. The Gophers' defensive turnover rate has fallen off a cliff, and one cannot simply pin that on the departures of last year's senior class. Returning starters Carlos Morris and Nate Mason have each seen their steal rates more than halved. No, this has to be the result of a schematic change. And I'm all for it, with the caveat that I'd like to see what Pitino traded all those turnovers for. This team still isn't rebounding, it still isn't defending the perimeter, and it's still fouling just as much as before. ** Nebraska is a tough team to figure out, in large part because it's played just one game against teams that are ranked lower than 20th in kenpom but higher than 323rd. Essentially, outside a neutral court win over Tennessee, Nebraska has played only really good teams or really bad ones. But it's largely blown out the bad teams and it's played two of the three good teams very close. So that's better than expected. As has been the case under Tim Miles, Nebraska's struggles tend to be on offense. Shavon Shields and Andrew White have been excellent, but almost everyone else is either too deferential, inefficient, or both. There are notable exceptions, and they happen to be freshmen (Glynn Watson and Jack McVeigh in particular). Providing more playing time to Watson would likely come at the expense of upperclassmen Tai Webster and Benny Parker. Sure, Webster is playing some of his best basketball right now, but that's kind of the point—he still hasn't been very good. These guys have been playing starter's minutes for the past 3-4 seasons, and it has not produced stellar results on offense. The Cornhuskers have a couple of winnable but challenging games coming up against Creighton and Rhode Island. Those are perfect opportunities to see what the kids are made of. ** The Bill Carmody Era was defined by above-average offenses and poor defenses. Those offenses were at times great when turnovers became increasingly scarce and the team was accurate with its many three-point attempts. But for some good defensive 3-point luck in the first year under Chris Collins, the ex-Duke assistant has basically kept that going. The Wildcats shoot a ton of 3s, don't turn the ball over much, and all but ignore offensive rebounds and getting free throws. On defense, the team has a bit different identity, preferring to challenge 2s more aggressively but not getting into passing lanes as much as Carmody's teams. So, basically this coaching change has just traded one defensive battleground statistic for the other. That said, we can't assume Collins has squeezed everything he can out of these Wildcats. I imagine he spends a fair amount of time stressing over his wing positions. The guards are entrenched in Bryant McIntosh and Tre Demps, and Alex Olah might be more valuable to his team's success than any other Big Ten center. But what to do with the wings? The first three players are highly efficient players that account for close to an average amount of possessions, while Sanjay Lumpkin is an extremely deferential player offensively, but possibly the best rebounder and defender on the team. This choice isn't an easy one. While Northwestern can make the most improvement on defense and on the glass (where Olah is the only player besides Lumpkin rebounding with any regularity), any possessions ceded by a role player must go to someone else. Keep in mind, this offense is still only powered by ball control and outside shooting—there isn't a lot to fall back on. The Wildcats' cupcake non-conference has it sitting with a 7-1 record, but with no wins that are likely to be credited on Selection Sunday. Thus, the path to the first ever Tournament berth likely will include at least 9 conference wins. Whether they can get there could very well be decided by how much offense Collins has to trade for rebounding. ** It doesn't take a rocket scientist to figure out what's wrong with Ohio State's offense. Indeed, the Buckeyes are turning the ball over at unprecedented rates for the Matta regime. 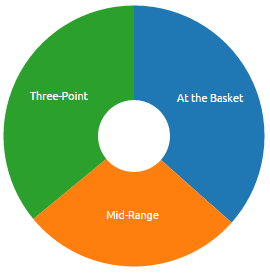 This is a perfectly good shot distribution, which should indicate good things for the offense. The problem, however, is that despite this aesthetically-pleasing pie chart, the Nittany Lions rank 266th in eFG in Division I. The only shot Pat Chambers' team is near par is with outside shots—and that's with Brandon Taylor and Shep Garner shooting a combined 45 percent on 3s. Taylor is a career 33 percent three-point shooter, and I have my doubts that Garner's 46.7 percent figure holds up as well. The rest of the team is a combined 15/67 (22.4%). What's more troubling is the fact that 6-4 freshman Josh Reaves is the only player that's an above-average finisher at the rim (58.3%). Maybe he's the next Jae'Sean Tate, but that's probably a longshot. Surely Donovan Jack, Julian Moore, and Jordan Dickerson will improve their shooting percentages on close-in shots, but the fact that teams know they don't have to worry too much about PSU's perimeter game isn't going to make things in the paint any easier. ** In the season preview, I touted Purdue as an interior-focused team that will be starved for ballhandlers. And that's mostly been right. Purdue is holding opponents to a DI-leading 35.8 percent on two pointers, while it's been dunking its way to 76.2 percent on shots at the hoop (4th in Division I). It's rebounding on both sides of the ball, and—perhaps most impressively—the team is fouling at very low rates despite giving lots of minutes to AJ Hammons, Isaac Haas, and Caleb Swanigan. Offensive turnovers are the clear weak link of this team, however, and Johnny Hill's high turnover rate suggests that he's not the long-term answer at point guard. However, Vince Edwards has looked very capable in that role, and Kendall Stephens, Dakota Mathias, and freshman Ryan Cline have provided enough ballhandling to keep the rate at non-horrific levels. The good news for the Boilers is that they play in the Big Ten, where Shaka Smart does not coach. Nonetheless, I do think we'll see Hill's minutes steadily decline in step with his two-point percentage, which is currently at an unsustainable 77 percent. ** Rutgers is not a good team, and strangely has played a number of non-conference games against probable RPI top-100 opponents (with two more on the way). So that explains why this team might have 7 non-conference losses before opening up Big Ten play against Indiana. But it's not all bad—pop quiz: who attempts more of its shots at the rim than any other Big Ten team? Well, since this is the Rutgers section, you probably know the answer. And it's not like the Scarlet Knights can't put the ball in the hoop when they take those shots, as they're converting them at an average 55 percent clip. 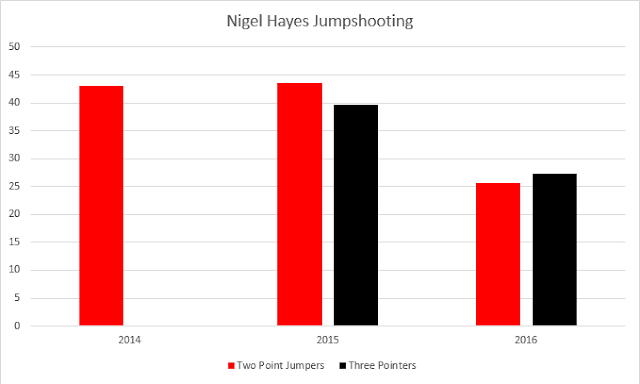 But the team is making just a third of its two-point jumpers, and even while being super selective with its 3s (just 23.5% of all FGAs), it still can't manage to make shots outside 20 feet with any frequency (28.3%). I'm really at a loss for this one, as there really isn't anyone jumping off the roster as a candidate for in-season improvement. The rebuild is in its 10th season, with no end in sight. ** The Badgers seem to have stabilized after a terrible loss at home to Western Illinois to open the season. The drubbing in Norman doesn't look so bad after the Sooners bulldozed Villanova. But this team is still doing some very un-Bo Ryan things, and chief among them is defensive rebounding. Frank Kaminsky was an outstanding defensive rebounder and Sam Dekker was a capable one for a wing, but Ethan Happ and Vitto Brown have done a great job replacing those two in that respect. 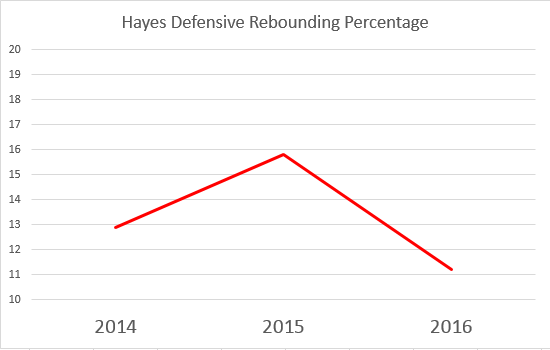 However, Nigel Hayes' defensive rebounding has fallen off significantly this season. So there, if I haven't fixed your team, I've at least told you what's wrong with it. That's something, right? Also, hopefully I'll be posting a bit more frequently in this space, and I may even make good on the blog's plural promise. Stay tuned.